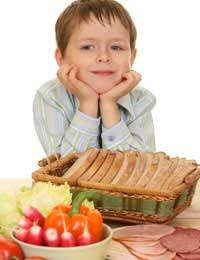 If your kids are complaining that their sandwiches are boring suggest they try experimenting and making their own! With the choice of breads and fillings available, there’s no reason why sandwiches should be anything less than exciting. It appears that sandwiches in various forms have been popular for a very long time, but it’s thought that they got their name from the Earl of Sandwich in the eighteenth century. During a long card game, he requested food and was brought a plate of bread, cheese and meat. So that he didn’t have to stop gambling, he stacked the three together to be able to hold and eat them with one hand. It’s said his playing companions requested ‘the same as Sandwich’, and hence the name was born. Put 2 eggs in a saucepan making sure they’re just about covered with water. Bring the water to the boil and then turn down the heat and let the eggs simmer for about 10 minutes. Drain the water and run the eggs under cold water until they’re cool enough to handle. Peel them and, using a fork, mash them in a small bowl. Season with salt and pepper and add 1 tablespoon of mayonnaise. Mix together well. Spread 4 thin slices of wholemeal bread lightly with softened butter or margarine. Divide the egg between 2 slices. Snip some cress leaves on top of the egg mixture before topping with the other slice of bread. Cut each sandwich diagonally into four. Depending on the size of the eggs, this should make a generous filling for 2 or even 3 rounds of sandwiches. Cut 2 thick slices of crusty white bread. Spread with a thin layer of mayonnaise. Grill 2 rashers of bacon until they’re crisp. Put the bacon and a few crunchy Iceberg lettuce leaves on one slice of bread. Top it with a few slices of tomato – try and find big flavoursome tomatoes. Put the other slice of bread on top and press the sandwich together lightly. Slice in half diagonally and enjoy. Mix together canned tuna and a spoonful of mayonnaise. Add some finely chopped spring onions. Spread wholemeal bread with the tuna mix. Thinly slice some cucumber and use to cover the tuna. Top with another slice of bread, and cut in half diagonally. For a healthy version, use tuna canned in spring water and low-fat mayonnaise and margarine. Peel and mash a banana. Mix in a few raisins. Spread the mixture onto 1 slice of brown bread and top with another slice. It’s probably best not to try and cut this as the banana is sure to ooze out so just hold it in two hands and prepare to be messy! Peanut butter and jelly sandwiches became an American institution after being invented by US soldiers during World War 2, using the ration packs allocated to them. The jelly that Americans traditionally use is a thinner, clearer version of jam without the fruity bits, like our bramble jelly or seedless jam. Although peanut butter is relatively high in fat, it’s the healthy monounsaturated sort of fat that doesn’t raise blood cholesterol levels. Take two cream crackers. Spread one with peanut butter, the other with jam (choose your own flavour). Put them together and sink your teeth in. Not really a new idea but a bit special. Slice a bagel in half and cover one half with cream cheese. Top with slices of smoked salmon (some supermarkets sell smoked salmon offcuts, which are cheaper) and some thinly sliced cucumber. A sprinkling of dill finishes it off. Top with the remaining half and serve. Spread a wrap with a thin layer of salsa sauce. Top with shredded iceberg lettuce, slices of Mexican chicken (available from supermarkets) and a sprinkling of grated cheese. Leave a bit without filling at the bottom of the wrap. Roll it and fold up the unfilled bit. Cut out the stalk and halve a red pepper. Remove all the seeds and cut it lengthways into strips. Place under a pre-heated hot grill with the skin side up, until it begins to turn black. Remove from the grill and allow to cool slightly. When the strips are cool enough to handle, peel off the skin. Slice open a pitta and spread with hummus. Add a few strips of pepper. And, if you like, a little shredded iceberg lettuce! Slice open the baguette – but don’t cut all the way through. Thinly slice some brie and cover one side of the baguette. Halve a handful of grapes (washed and de-seeded if necessary) and lay them along the length of the brie. Press together and serve with some extra grapes. Add some grilled bacon if you can't live without your meat fix.